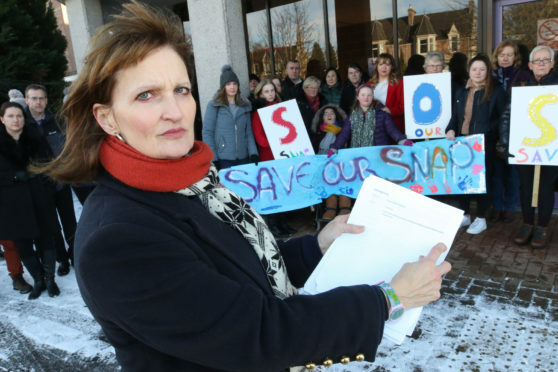 Campaigners yesterday ramped up their fight to ensure the vital Snap (Special Needs Action Project) service for young people with learning disabilities remains open, by handing in a petition to the Highland Council. Scores of parents and children who use the out-of-school social activities the charity offers gathered yesterday to officially hand over the petition in Inverness. In order to keep the charity afloat, Snap relies on a £70,000 annual grant from Highland Council to help fund its operating costs, which are in the region of £220,000. However, in a cost-saving effort, the provision was withdrawn by the local authority. Parents worry that without Snap there is nowhere to go for the youngsters, with potential closure bringing with it major implications to their mental health and self-esteem. Zoe MacKenzie, who launched the petition, has seen first-hand the benefits of Snap, with her 20-year-old daughter Orla using the service for the past 12 years. She said: “Snap allows Orla to go away and have fun. I know she is being stimulated and the activity provision is phenomenal. The campaigner’s petition has received the backing of over 3,200 signatories – however, Highland Council revealed it is unable to accept the document as a petition as it was not launched through their own petition procedure, and will instead look upon it as an online expression of support. Dawn Walker, manager of Snap, said: “Already for this year we are looking at a deficit of £90,000, part of which is a result of not receiving this funding. At present, 76 young people partake in Snap services, with 20 highly skilled workers set to lose their jobs if no alternative funding can be found by the beginning of the next financial year.